Crystal Clarity is an Illustrator, Muralist and Teaching Artist born, raised and based in New York City. Her work serves and celebrates women of color and communities of color. Her vibrant organic urban styles merge the intersections of culture, gender, spirit and city life. Working in a variety of mediums from pencil to paintbrush on anything from Bristol to Brick walls her work can be found on contour cut plywood, canvas or covering the side of a building in any one of the inner city boroughs. Clarity is an Innovative Cultural Advocacy Fellow (ICA) Alumni with the Caribbean Cultural Center African Diaspora Institute and has worked with several established non-profit organizations serving local communities through dynamic youth programs. For over five years Crystal was the Visual Arts Instructor at EL PUENTE, an after school community center in the heart of Bushwick, Brooklyn. Leading classes in silk-screen design, painting, drawing, book making, set design and other crafts, she closely mentored a diverse group of young people and deeply invested in their personal and professional growth. Since 2006 she has been an enthusiastic practitioner and mentor in the rich legacy of Mural Art beginning that journey with El Puente's "Los Muralistas" on the mural " Time Flies " . She has facilitated an assortment of public art projects all over New York City as a Groundswell Community Mural Project artist since 2008. With Groundswell she has had the privilege of partnering with community leaders and organizations such as Planned Parenthood, Uprose, New Yorkers Against Gun Violence, Community League of the Heights, the Department of Environmental Protection and the City Parks Department and the Dept of Transportation to name a few. 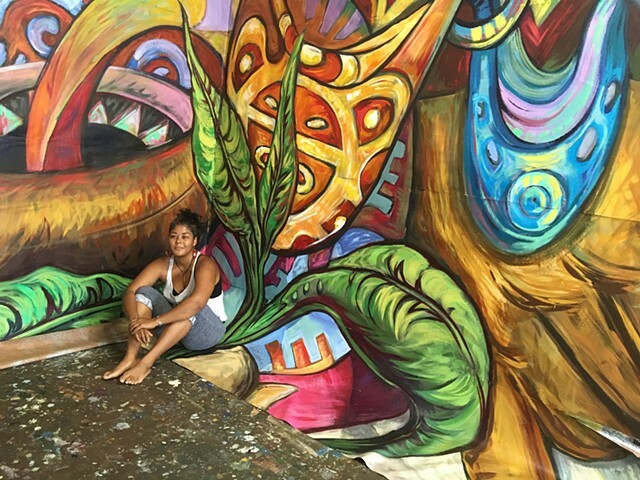 Her Murals have given visibility to critical community issues with sustainability, solidarity between diverse groups, gun violence, water conservation and reproductive justice. Clarity has also had the honor of working independently with Girls for Gender Equity (GGE) as both an artist in residency and a creative consultant. She currently stewards an arts collective, Peoples Collective Arts/ Collectivo de Arte Popular that offers visual strategies to movement work for social justice efforts. Crystal Clarity has advanced her craft at the Art Students League of New York, Penland School of Crafts and worked and studied bookmaking at the Center for Book Arts. She holds an Associates degree in Visual Communications and a BFA in Illustration graduating with honors from Parsons School of Design with a focus in printmaking. Crystal Hopes to continue her work as a Muralist and Teaching Artist while expanding her audience and partnerships abroad internationally.